Our next women's gathering is happening on Monday, December 10th from 7:00-9:00 pm at Ashely Gullett's home. 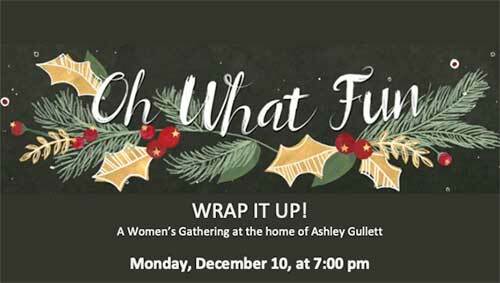 Join us for this Wrap It Up event--a relaxed evening, where we come together to work on projects for Christmas, share family traditions, enjoy one another's company, and pause to reflect on Christ during the busy season. Dessert and hot beverages will be served. Email us for directions or to RSVP and let us know you're coming! Newer PostLast Week to Help Fill Backpacks for the Action Shelter!